Marble, 52 5/8 x 15 ¼ x 17 1/8 in. Edmonia Lewis and John Gadsby Chapman depict the Biblical Hagar—an enslaved Egyptian and mother of Abraham’s first son Ishmael—after her banishment by the patriarch into the desert (Genesis 21:8-19). At the moment when Ishmael is dying of thirst, God hears his crying, and responds by leading Hagar to a spring of fresh water. Lewis and Chapman, both American artists working in nineteenth century Rome, portray the outcast “fallen” woman in a sympathetic light, accompanied by her most frequent attribute, an overturned jar. During the nineteenth century the name Hagar grew in usage, increasingly attached to both black women and references to slavery. In addition nineteenth-century culture typically associated Egypt, the Biblical Hagar’s homeland, with blackness. Despite these associations, both artists depict Hagar with European features. Here the similarities end, however. Although executed in Europe, the works make evident, strong attachments to contemporaneous American social and political concerns. This pairing of pieces, identical in theme, demonstrates how the Biblical Hagar was co-opted by proslavery and abolitionist forces to reinforce differing agendas. In the context of strict social mores of the period, these perhaps surprisingly empathetic portrayals help define the parameters of a concept of ideal womanhood that dominated much of the century. Of the many variations on the story that occur in the history of western art, artists most commonly depicted two: Hagar and Ishmael’s expulsion from the household of Abraham and the scenes in the wilderness. The former emphasizes the immoral sexuality of Hagar, while the latter allows for her deliverance as a nurturing, loving mother. Most nineteenth-century artists opted for a wilderness setting that emphasized the suffering position of Hagar who submits to forced dependency on a patriarchal society. Virginia artist John Gadsby Chapman created his first major painting Hagar and Ishmael Fainting in the Wilderness while studying in Rome in 1830. The first American picture to be engraved in Italy, it subsequently appeared, in the same year, in the Giornale de belle arti ossia pubblicazione mensuale della migliore opere degli artisti moderni Roma. Virginia-born Louisiana cotton broker John Linton (1786-1834), who had financially supported Chapman’s three-year European sojourn, was named in the journal, and the painting appeared in his New Orleans collection by 1832. Afterwards, the painting disappeared from the art historical record. The recent reappearance of this seminal picture provides an opportunity to place it, and other Chapman works, within the context of the antebellum concept of “true womanhood” that dictated piety, purity, submissiveness, and domesticity for all women. The picture’s muted color scheme of gold, umber and rose, reflects the young artist’s response to European influences in subject, costume, and drapery. As previously stated, the empty water jug in the foreground identifies the despondent subject as Hagar. The seated Hagar rests her right upper arm on a rock while her hand supports her head in a gesture that evokes extreme fatigue, fear, anger, and sadness. Her other arm drops to her lap and cradles her young son’s head and hand in a gesture of tenderness. Her parted lips and eyes are raised heavenward, in desperation. Ishmael’s expression is resigned and his fist, resting on a rock, provides one of the lovelier visual passages. The tenderness expressed in tactile qualities created where the boy’s cheek, hand, and her hand touch contrasts with the stony hardness of their surroundings. Hagar’s costume, with its laced bodice and white chemise, in addition to her braided hair, appear more European peasant, than Biblical, in origin. Reflecting classical influences, both figures have bared shoulders that suggest the vulnerability of their situation. The pyramidal shape of the combined figures adds to the overall feeling of emotional weightiness. Though surrounded by dark clouds, in a sign of hope, a theatrical light bathes the figures from above. John Linton married into the prominent cotton growing Surget family of Adams County, Mississippi. That the painting came to reside with a family of Mississippi planters creates a fascinating conundrum. As stated earlier, in the nineteenth century, the figure of Hagar often symbolized enslaved African-American women. While difficult to imagine Chapman, a Confederate sympathizer, or Linton, a planter’s agent, viewing the subject from this perspective, why then did the subject appeal to them? Considering Chapman’s treatment of Hagar in light of the artist’s best-known work, The Baptism of Pocahontas, located in the Rotunda of the U. S. Capitol building suggests a possible explanation. The epic painting depicts the first conversion of an American Indian to Christianity. Many of Chapman’s works have religious themes, and it may be possible to view his treatment of non-European women, including the Egyptian Hagar, from an idealized Christian perspective. Both pictures suggest that non-white women should follow the dictates of white culture, and that Christians had a moral duty to share, often forcibly, their religious beliefs. This civilizing responsibility lent the proponents of slavery a defense against an otherwise shameless institution. 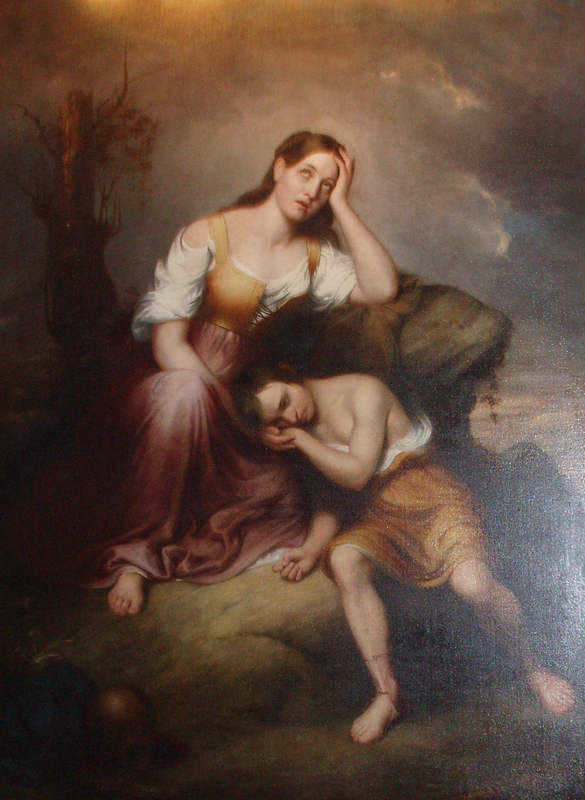 Chapman permits the redemption of Hagar by emphasizing her deference to God and her motherly devotion to Ishmael. By making the subjects white, he may have simply been following a prevailing tradition, or responding to the perceived desires of his patron. Other American artists working in Italy also embraced the theme. 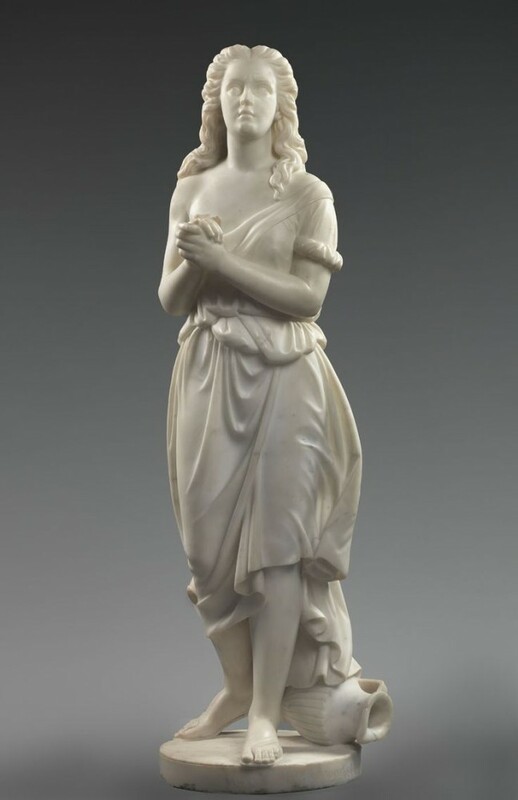 Later more independent and assertive representations of women appear in works such as those of Edmonia Lewis who joined a sizable community of women sculptors in Rome in 1865. Like Chapman, Lewis depicts the Biblical Hagar at the moment she encounters God in the desert. Her representation of Hagar (1868 or 1875) in marble shows her alone and upright and on the verge of moving forward. Though in obvious distress, her clasped hands indicate independent resolve as much as they do prayer. Firmly planted, her left foot carries the weight of the figure while the right one, pushes off the ground behind her, thereby suggesting imminent propulsion. The artist presents her subject in the neoclassical style typical of the period, accompanied by the overturned water pitcher. Curiously, Lewis excludes Ishmael from the scene, though most artistic renderings of the period include him. Thick wavy hair, parted in the middle, frames an oval face, from which eyes gaze outward to God. Her small closed mouth and straight nose appear ethnically European. Her dress consists of a simple tunic, gathered at the waist. The skirt pulled up on the left side, results in an uneven distribution of fabric that implies an adjustment made out of necessity and anxiety. She wears plain sandals while her calves, right shoulder, and right breast are bare. In a classicizing effect, the animated folds of drapery in her skirt ripple and flow backward while also clinging to her abdomen, thereby revealing the contours of her thighs. The pose exhibits a restrained contrapposto as the weight of the figure seems distributed between both legs and the shoulders and hips are fixed in relation to the figure’s central axis. The interplay of the oppositional qualities of simultaneous stillness and motion conveys a moment of emotional turmoil. Lewis’ biography raises questions about her portrayal of Hagar as white. Born in New York State, Lewis was the child of parents with Chippewa and African American ancestry. She studied at Oberlin College and subsequently settled for a time in Boston, becoming associated with a prosperous and influential anti-slavery community that included Lydia Maria Child and William Lloyd Garrison. She studied with the sculptor William Brackett and created portrait busts to earn money for her relocation to Rome. Lewis broke new ground by obtaining international acknowledgement for her work as an artist. The first nonwhite artist to achieve this level of success in sculpture, she frequently chose subjects that reflected her dual ethnicity and gave expression to anti-slavery and American Indian concerns. Bassham, Ben L. Conrad Wise Chapman: Artist & Soldier of the Confederacy, Kent State University Press, Kent, Ohio & London, 1998. Buick, Kirsten P. “The Ideal Works of Edmonia Lewis: Invoking and Inverting Autobiography, American Art, Vol. 9, No. 2 (Summer, 1995). Gabler-Hover, Janet. Dreaming Black/Writing White: The Hagar Myth in American Cultural History, University of Kentucky Press, Lexington, 2000. Scarborough, William Kauffman. Masters of the Big House: Elite Slaveholders of the Mid Nineteenth-Century South, Louisiana State University Press, Baton Rouge: 2003). Stebbins, Theodore E., Jr. et al., The Lure of Italy: American Artists and the Italian Experience 1760-1914. (New York: Museum of Fine Arts, Boston in association with Harry N. Abrams, 1992). Welter, Barbara. “The Cult of True Womanhood: 1820-1860”, American Quarterly, Volume 18, Issue 2, Part 1, (Summer, 1996). Previous to the depicted incident, Sarah, Abraham’s wife, abused the pregnant Hagar causing her to flee into the desert. Even though Hagar suffered mistreatment, God found and instructed her to return to Sarah and serve her willingly. Later, Sarah gave birth to a son Isaac. She subsequently perceived Hagar and her offspring as a threat and successfully sought their removal. Janet Gabler-Hover, Dreaming Black/Writing White: The Hagar Myth in American Cultural History, University of Kentucky Press, Lexington, 2000, 11. Ben L. Bassham, Conrad Wise Chapman: Artist & Soldier of the Confederacy, Kent State University, (Kent, Ohio & London, 1998) 6-7. Surget Family Papers, (Z 1496.000 M) Mississippi Dept. of Archives and History, accessed online. Barbara Welter, “The Cult of True Womanhood: 1820-1860,” American Quarterly, 18, Issue 2, Part 1, (Summer, 1996), 152. Theodore E., Stebbins Jr. et al., The Lure of Italy: American Artists and the Italian Experience 1760-1914. (New York: Museum of Fine Arts, Boston in association with Harry N. Abrams, 1992), 241. Kirsten P. Buick, “The Ideal Works of Edmonia Lewis: Invoking and Inverting Autobiography,” American Art, 9 (Summer, 1995) 10-11.